Vernon - Atlanta CORRECT FIT "Purchased this one month ago and girlfriend and I think it's great!! Different fit, its adjustable in the lower back to give tapered look. My lady is a big girl and it fits her well. I've returned X/L jackets that are wayyyy to small for my lady. 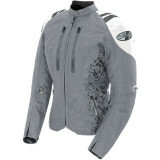 Very thin membrane for summer riding, not zipper ventilated but it doesn't need to be. Armor is questionable, I suggest upgrading. 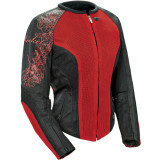 Keep lining with you on the bike, on a cool morning/evening the jacket without lining will not be enough at 60 and below, but it's great for hot midday sun and warm/hot temps. I have the mens Joe Rocket same color combination in textile and we look good (not matchy/matchy) on 2018 Goldwing Airbag DCT."